There is something about wearing sunscreen that makes kids try all sorts of stunts to evade it. The only way to get them to believe that sunscreen is good for them is to shown them physical evidence. This free science experiment for kids is just what you need! 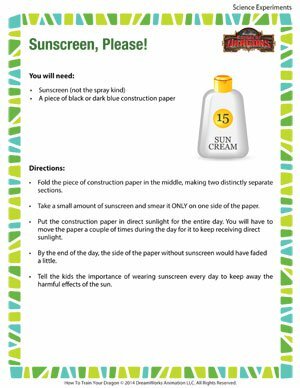 Gather a few easily available goodies to teach the young ones the importance of wearing sunscreen regularly. And once you have done that, check out our scientific method worksheets for more fun ways to learn science!